Shop online for 2 eastern-express plastic models at discounts up to 46%. 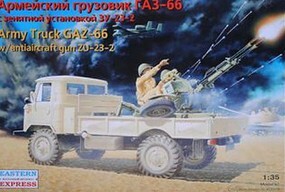 This is the 1/35 Scale GAZ66 Russian Military Truck with ZU23-2 Anti-Aircraft Gun Plastic Model Military Vehicle Kit from Eastern Express Models. 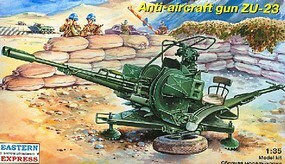 This is the 1/35 Scale ZU23 Russian Anti-Aircraft Gun Plastic Model Military Kit from Eastern Express Models.